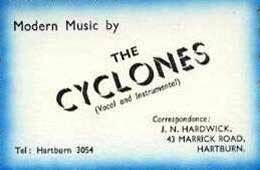 Briefly known as The Floridas, The Cyclones were formed in 1962 by six pupils from Grangefield Grammar School in Stockton. Cliff Thornton on drums, Brian Humpherson on keyboards, Pete Mackie and Mike Wassall on guitars, Norm Hardwick on bass and Geoff 'The Blues' Barker on vocals. 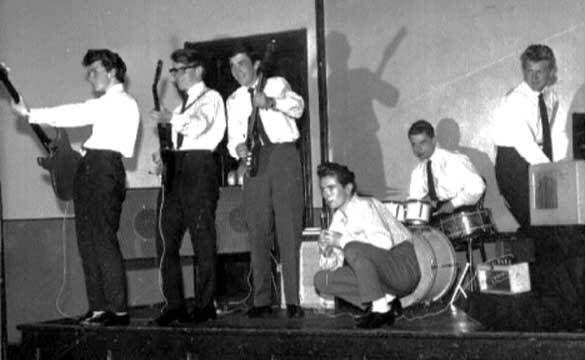 The Cyclones on stage at the pantomime “Mutiny in Strangefield” at Grangefield Grammar School in 1962 with Norm Hardwick, Brian Humpherson, Mike Wassall, Cliff Thornton and Pete Mackie. The Cyclones at the Presbyterian Church on Yarm Lane in Stockton. The church was very close to Burdon’s music shop where many people would spend their time checking out the latest kit and gossip from other band members. 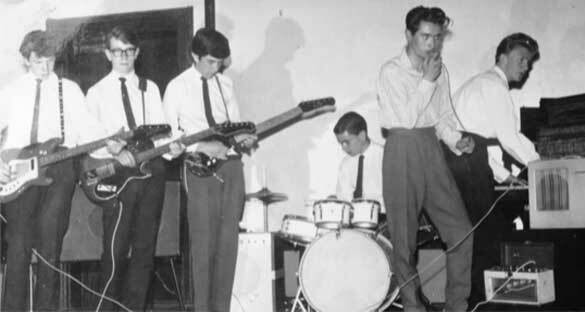 Pictured above, back in 1963, are Norm, Mike, Pete, Cliff, Geoff and Brian. 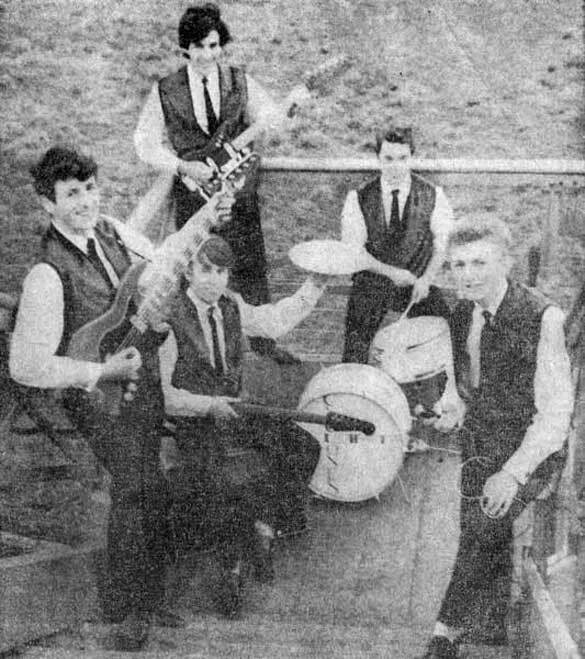 The Cyclones were also one of many acts to be included in the memorable Evening Gazette “Battle of the Bands” in 1964, They made it to The Astoria in Middlesbrough - only to be knocked out by The Kalvins - so they then returned to what was almost a residency at The Brunswick on Yarm Road and the back room at The Sun Inn on Stockton High Street. 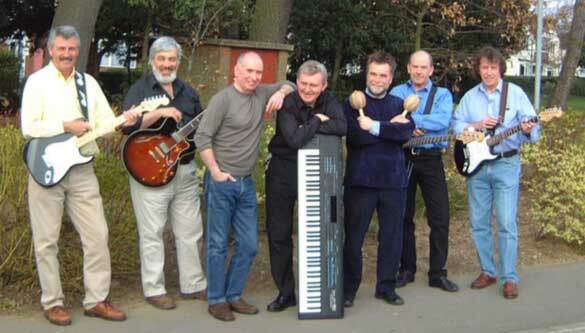 The Cyclones with Graham Rayner, Mike Wassall sitting, lead guitarist Pete Mackie standing at the back, along with Cliff Thornton on drums with Brian Humpherson who played piano and vocalist. 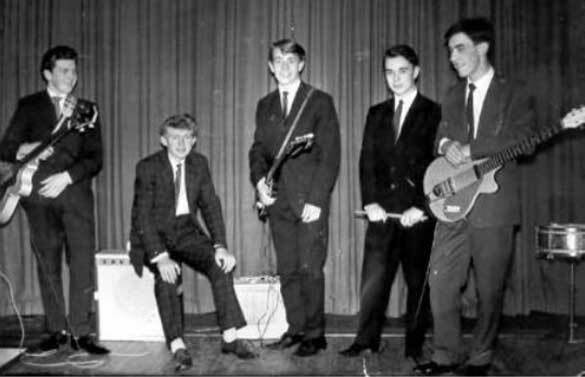 The Cyclones continued their late-night life style with many shows a week - followed by an early rise for school the next day from 1962 to 1965 when university kicked in which meant the dispersal of everyone throughout the UK. The parents of The Cyclones must have been very understanding or, as Brian Ashcroft says in his book on "Stars Fell on Stockton", perhaps they understood it as a way of seeing off teenage rebellion. The Cyclones as they are today - with Graham Rayner, Pete Mackie, Geoff Barker, Brian Humpherson, Cliff Thornton, Norm Hardwick and Mike Wassall following a practice session in Leicester. Their ‘world tour’ continues today from Teesside to Southport, from London to Cambridge and from Devon to Spennymoor. They’ve certainly done it all and if you want to keep up-to-date with The Cyclones be sure to visit their own website. The bass playing monkey on this page was created by Dave Sutton graphics and free 3D animated gifs for web sites. 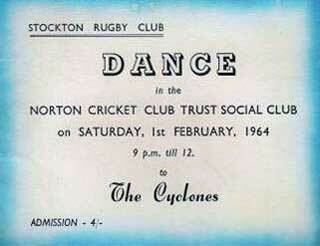 Modern music by The Cyclones business card from those early days. The Cyclones performed at Norton Cricket Club Trust Social Club on Saturday, February 1st, 1964. 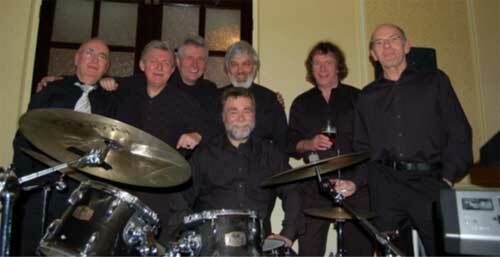 The Cyclones, as they were in March 2006, in the ballroom at the St. George Hotel, Teesside Airport with Geoff, Brian, Graham, Cliff (sitting), Pete (standing), Mike and Norman.